Drone operator SkySkopes and eSmart Systems were quickly on the scene in Jacksonville, Florida, after Hurricane Irma to help safely restore power to thousands of customers. The use of UAS for disaster response is likely to be an ongoing trend. End-user clients looking for unmanned aircraft systems-services will most likely recognize the UAS-world's newest duo of big-name collaborators: Intel and Honeywell. Learn why they are working together and what they have to offer. Avitas Systems and NVIDIA have partnered to take industrial inspection using drones and other robotics to a new level. Artificial intelligence, deep learning and super-computing power in the field can not only find problems, but also predict them. In partnership with Intelligent Energy, FlightWave Aerospace Systems is launching its second new unmanned aircraft system in less than a month. The Jupiter-H2 aircraft runs on a 650W fuel cell, providing longer endurance and greater payload capacity. Verizon's continued integration of unmanned aircraft systems into the communication giant's internal operations and external offerings was on full display post Hurricane Harvey. The Risk Management Society Annual Conference held earlier this year in April provided the backdrop for a new survey that reveals the mood of risk managers on drones. 100 risk managers were surveyed. Atlas Dynamics, a leading provider of drone-based solutions for the professional user, has released its new Atlas NEST smart protective charging station for autonomous BVLOS operation. 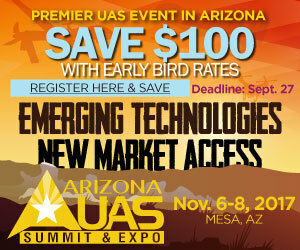 Focused on both small and large unmanned aircraft systems, the 2nd Annual Arizona UAS Summit & Expo will reveal how Arizona and surrounding southwestern states are leading in the commercialization of UAVs. The event will be held in Mesa Nov. 6-8.